Well, we barely survived the first week of school. That may be an exaggeration but it sure was eventful. 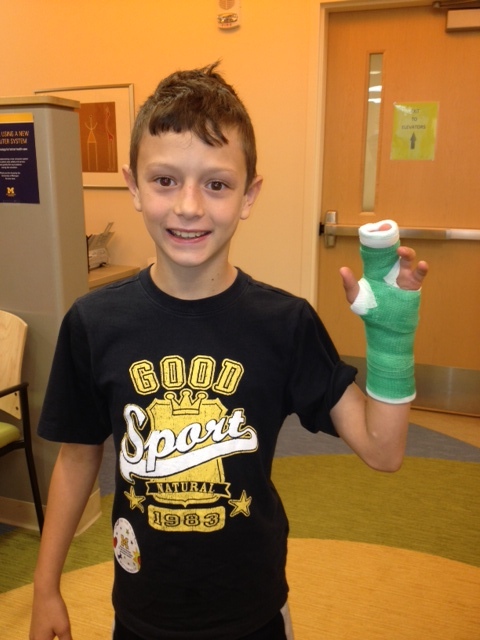 The previous week, my son hurt his finger in football. I’m still unclear as to exactly what went down, as the story has changed over time to jamming his finger on someone’s shoulder practice during a drill to hitting his finger while catching a football. Whatever way it happened, the result is the same – a fractured finger. We had been to the doctor’s office the day after it happened and they gave us a splint and set up an appointment with a specialist. Luckily, so to speak, the first day of school was a half day, so we were able to schedule an appointment with a hand specialist. Because my son is my son and is not prone to standing around and staying near the ground, the doctor recommended putting a cast on to keep the finger stable and safe. I wholeheartedly agreed after watching him trying to keep a splint on it during the previous week. It was a great novelty for the first 24 hours or so. He came home from the next day of school and had autographs on his cast. When we went to his sister’s school’s open house, he had to make sure to visit each and every one of his previous teachers to say “hi” and receive a “what happened?” from each of them. Then, it started to get itchy. And he wanted to bend his fingers. And he can’t catch a Nerf football, or basketball or any other ball. He was banned from his bike, his scooter and anything that would take him off of the ground. Not to mention taking a shower, which has to be “backwards” while the hand with the cast is sticking out of the curtain. So we enter the waiting phase, and in just over two weeks, the cast will be off and we’ll see if he’ll resume his football for mid-season or if the season is over until next year. Either way, he’ll have a very memorable first day of 5th grade.